So many good things continue to unfold on behalf of our 13,000 Michigan children, youth and families involved in foster care! Sign up for the FSM Newsletter! Thanks to this network, we've also heard about another organization devoted to our kids, "Overcoming Odds. " 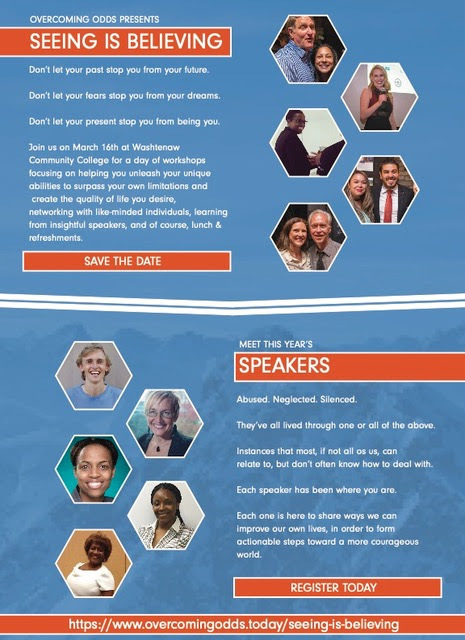 Here's a link to their website: https://www.overcomingodds.today On March 16th, Overcoming Odds will be hosting a conference, "Seeing is Believing" to elevate the voices of local adoptees and foster youth. Says founder and director, Oleg Lougheed, "Come join us at this day long conference to help you unleash your unique abilities to surpass your own limitations and create the quality of life you desire. Take the next step and reserve your seat today." For more information, please check out the fact sheet below. HOPE YOU CAN MAKE IT TO ONE OF THESE UPCOMING FAITH COMMUNITIES COALITION MEETINGS IN MARCH AND APRIL. March 4th, 2019, 6:15 p.m.
"The 3rd Circuit Court Juvenile Division is flooded with traumatized children and families facing extreme challenges brought on by poverty, mental health issues, domestic violence and substance abuse on a daily basis. Repeated traumatic events make the concept of a "normal" childhood impossible for children in these families and research indicates that experiencing these events in childhood leads to increased rates of teen pregnancy, substance abuse, illiteracy, chronic absenteeism and school dropouts, which in turn leads to higher rates of crime, poverty and homelessness, the ultimate plagues to our communities. The Juvenile Division handles cases of parental neglect and abuse, and juvenile crime. While there are Department of Health and Human Services caseworkers, and probation officers, assigned to provide assistance and guidance in these cases, but they can only do so much and much more needs to be done to give these children and families a fighting chance. The best way to help these families is to be face to face in the neighborhoods where they live. To that end the Juvenile Division Judicial Engagement Team led by Judge Frank Szymanski and Deputy Court Administrator Richard Smart is working to develop a network to allow volunteers to help in cases where a family needs assistance with moving, or clothing, or furniture, or housing, or other needs. Mentors for youth and parents can be especially helpful because many of these cases are the result of generational neglect. It can make a world of difference to these families to know there is someone nearby who cares and is willing to help." As always representatives from agencies serving children and families in the foster care system will be with us to update us about needs and ideas. Tuesday, March 5 at 5:00-7:00 PM, Heart of Detroit FCC held in conjunction with The Michigan Children's Law Center and the Adoption and Foster Care Outreach of Fellowship Chapel, 7707 West Outer Drive, Detroit, Mi, 48219. Berlinda Good, coordinator, bgood20@aol.com . The Hon Judge Deborah Thomas will present on Expungements for our Aging Out Youths and Adults. Thursday, March 21, 2019 5:30 PM Northern Michigan FCC, First Presbyterian Church of Gaylord, 513 Charles Brink Road, Gaylord, 49735. 5:30-6:00 PM Potluck theme: Cold cuts and finger foods, followed by a 6:00-7:30 PM Parent Meeting/Training. Children gather separately from 6:00-7:30 PM with activities and games sponsored by the church. PLEASE RSVP at least 7 days prior to each monthly meeting/event. Contact Lori Hunt 989-370-6831, Marc Morrell 989-395-2144, or Donna Mooney 989-798-4762 to complete your RSVP. DHHS may also complete phone call/emails/and-or text message as a reminder. Please feel free to contact us with any questions. Meets third Thursdays of every month. TOPIC: OPEN FORMAT-Come prepared to discuss a current challenge. Tuesday, April 2, 5:00-7:00 PM, Heart of Detroit FCC held in conjunction with The Michigan Children's Law Center and the Adoption and Foster Care Outreach of Fellowship Chapel, 7707 West Outer Drive, Detroit, MI, 48219. Berlinda Good, coordinator, bgood20@aol.com. All Wayne County child welfare organizations are invited to display their materials and share information. Free Prom or Homecoming gowns for our girls in Foster Care. Theme: National Prevent Child Abuse Month. Keynote Jurist, The Hon Judge Vonda Evans (retired) will present on Felony Child Abuse Cases n preventive measures. Panel includes Attorney Wyatt Harris and Attorney Janice Burns....both represented the Freezer Mom case...Free prom/homecoming dresses will be available for our young ladies in foster care. Thursday April 18, 2019 5:30 PM Northern Michigan FCC, First Presbyterian Church of Gaylord, 513 Charles Brink Road, Gaylord, 49735. 5:30-6:00 PM Potluck theme: Luau followed by a 6:00-7:30 PM Parent Meeting / Training. Children gather separately from 6:00-7:30 PM with activities and games sponsored by the church. PLEASE RSVP at least 7 days prior to each monthly meeting / event. Contact Lori Hunt 989-370-6831, Marc Morrell 989-395-2144, or Donna Mooney 989-798-4762 to complete your RSVP. DHHS may also complete phone call / emails / and-or text message as a reminder. Please feel free to contact us with any questions. Meets third Thursdays of every month. The Urban Review Season 2 is up now! CUYFD Awarded with 2018 DFC Grant! The Center for Urban Youth and Family Development is pleased to announce that the Coalition for Urban Youth and Family Development has received a 5-year, $125,000 grant from the Office of National Drug Control Policy. The DFC Program provides grants to community coalitions to strengthen the infrastructure among local partners to create and sustain a reduction in local youth substance use. These funds will support CUYFD’s efforts to mobilize our community to prevent youth substance abuse. 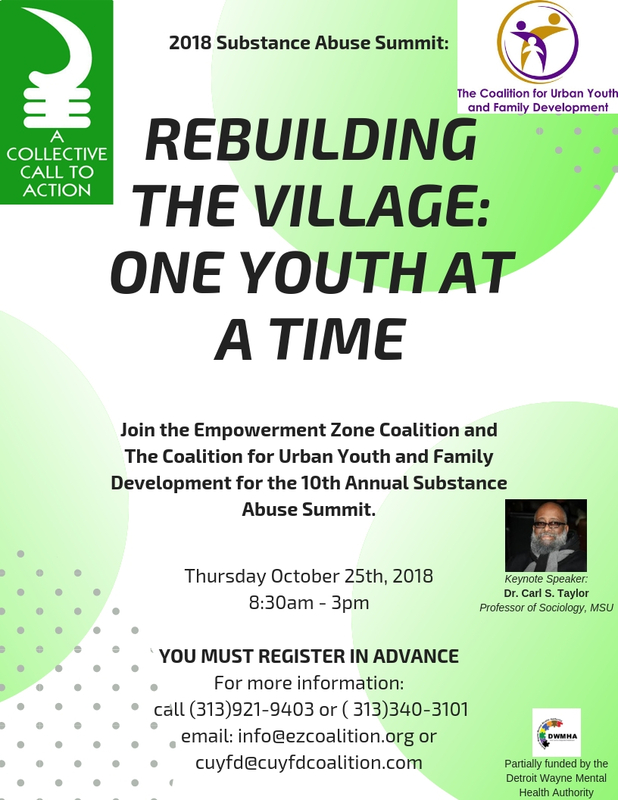 The Coalition for Urban Youth and Family Development is a Drug Free community coalition working together for the greater good of Detroit’s Westside. Our mission is to improve outcomes for west side Detroit youth and their families by establishing and strengthening community collaboratives that promote positive youth development and community revitalization through the prevention of youth substance abuse and other problem behaviors. For more information about The Coalition for Urban Youth and Family Development check out the website and make sure to follow us on instagram and twitter and like the facebook page! We're two weeks into the 2018 Summer Youth Employment Program and things are in full swing! During the beginning of the program, the workers participated in a community resource fair/Flint water drive at the Bel-Air Movie Theater located on the Eastside of Detroit. The fair had many different community organizations providing information to Detroit citizens about the useful resources in the community. It was an amazing experience for the workers and now they know that there are many tools in the city of Detroit that are always available to them. Our employees also visited the Charles H. Wright museum, which was a perfect opportunity for the group to bond with each other and learn at the same time. Next we went to the Detroit Institute of Arts where we were blessed to be the first public patrons to experience the Museum using the new Lumen Augmented Reality system. During the second week, the workers began to read “I Have a Story to Tell”, the book that tells the life story of Marsialle Arbuckle Sr. The youth read the book together as a group along with Mr. Arbuckle and it gives the young ladies the opportunity to develop new skills such as, teamwork, cooperation, communicating and more. 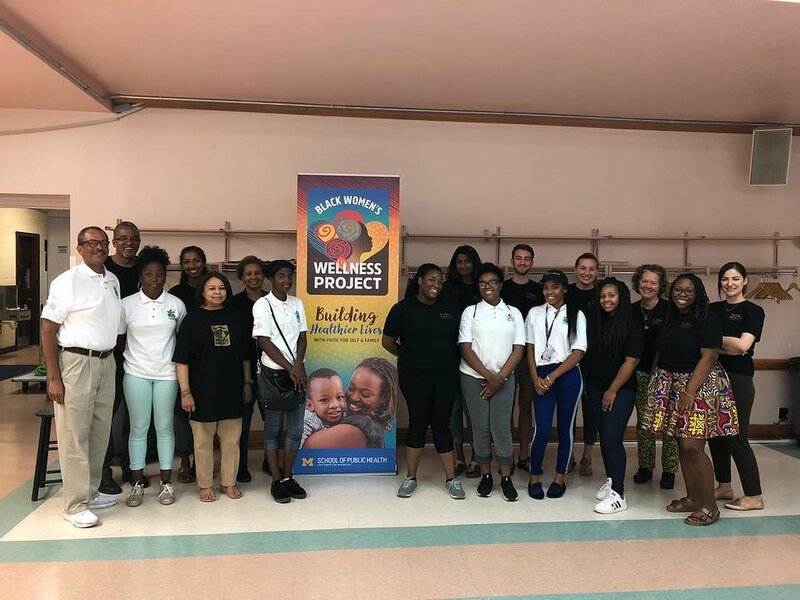 As seen in the picture above, we were able to attend the Black Women's Wellness Project, which is a mobile health clinic hosted at Hartford Memorial Baptist Church by the University of Michigan School of Public Health. They also started their teen parenting class in which the ladies will receive a “baby” that they will have to care for throughout the course, and if completed correctly, they will receive a $100 stipend. This class is to provide guidance for those who are teen parents or one day hope to be parents. The Center for Urban Youth & Family Development provides not only job opportunities for these young ladies but guidance and social stability as well. We're in the second week of our 6 week suicide prevention workshop series at Voyageur Academy. 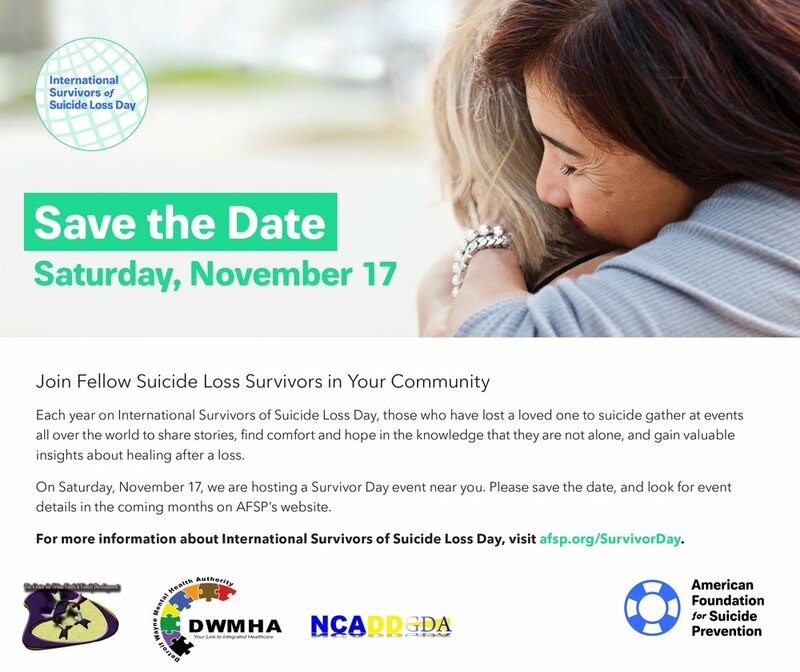 Our Program Director Marseille Arbuckle, Jr. is using the Lifelines Suicide Prevention curriculum to increase awareness about warning signs of suicides, the importance of mental health, and ways to address with a suicidal friend. The students are enjoying the opportunity and we have a surprise for them at the end of our six weeks! Tuesday, May 1, 5:00-7:00 pm. "I think this forum can be a vital and critical link to help return children home... for foster families in Wayne County", said the event's host, Attorney Berlinda Good. "In addition to the seasoned and knowledgeable panel we will have resource tables manned by various Adoption Agencies and the Michigan Adoption Resource Exchange, MARE", Good added. She also pointed out that the event will explain how we need the Churches and volunteers from the community to supervise family visits set up at Greater Grace thru 3rdJudicial Circuit Court. All Wayne County child welfare agencies are invited to come and display materials and hand-outs. Western Wayne/Oakland County FCC First Presbyterian Church, 701 Church St, Plymouth, MI 48170 Contact: Peggy Fisher-Kmieciak, pfk75@hotmail.com; Sheila Henderson, rjsah@sbcglobal.net. Airika Buford and students from Wayne State University's successful program, Transitioning into Independence, (T.I.P.) for students who have experienced foster care will share experiences and ways we can help support them. Tuesday, May 15, 6:30 pm. Northern Michigan FCC, First Presbyterian Church of Gaylord, 513 Charles Brink Road, Gaylord, 49735. Golf Outing at Graying Country Club. Date to be announced. For information contact Lori Hunt 989-370-6831, Marc Morrell 989-395-2144, or Donna Mooney 989-798-4762. Did you know that there are 13,000 children in Michigan currently in foster care? Many have found safe places to stay. Yet there are some 4000 children and youth who have urgent needs. They need stable, loving care and relationships with a nurturing adult. No matter how much time you have to give, you have the power to do something positive that will change a lifetime for a young person in foster care or who is aging out of the system. As Mother Teresa has claimed, "Very few people can do great things, but each of us can do something with great love." During the month of May we anticipate the great good that will come from members and friends finding that one something to share with great love. Together, with other congregations, this will make a significant impact to alleviate the suffering of our most invisible, voiceless and vulnerable children. If every congregation would take responsibility for just one child, our foster care crisis can be solved. Here are some ideas to help promote May as Foster Care Month in your local congregations. And organizations. See the Faith Communities on Foster Care Coalition articles on www.faithcommunitiescoalition.org for a list of Care Kits, donation drive items, and additional ideas. Week One of May: Launching May as Foster Care Month: Who are the foster kids in Michigan? How many? Put a face on foster care: Invite a foster youth or foster care worker to share a moment for mission. Include current statistics or stories. Congregational challenge: Chose a child waiting for a forever family off of the MARE web site to pray for during the month of May (www.mare.org): Check to see who foster or adoptive parents in your own congregation are. Start your own foster/adoptive parents conversation group. Week Two of May: What act of concrete care can I do to make the life of a foster youth better? Congregational challenge: Fill Care kits for foster kids. See suggested templates. Attach list to bags distributed after the service-or have a sign-up sheet for specific articles. Week Three of May: What's involved with being a foster parent/grandparent/tutor/mentor?? Hold an informational gathering on ways of personal involvement from volunteering to supervise foster kids while parents meet, tutoring, foster/adoptive parenting, mentoring, becoming respite foster parents/grandparents. Contact your local service agency to arrange for a speakers and meeting time. Week Four of May: Dedication and blessing of care kits and those who receive them. Wrap up month of praying for one child by including their names during prayers of the people. Display the collected items and offer a prayer of blessing for the donations and those who will receive them. Today, CUYFD in conjunction with NCADD and Spectrum Human Services travel to our states capitol to advocate on behalf of prevention efforts in Metro Detroit. Our program director Marseille Arbuckle, Jr. had the chance to meet with Rep. Morris Hood and Rep. Coleman A. Young III for some productive disccusions on various prevention related subjects including the current marijuana legalization initiatives and their impacts on our community. Thank you to Omega Psi Phi Fraternity, Inc.! We are proud to announce that the generous brothers of Omega Psi Phi Fraternity, Inc. have agreed to be the lead sponsor of this years Annual Prostate Cancer Survivors Golf Outing! We are excited and proud to have them on board and look forward to throwing another successful fundraiser this year! See you all on August 17th at Idyl Wyld Golf Course! Featured guest our program director Marseille Arbuckle, Jr! CUYFD is happy to announce that we have been awarded the Suicide Prevention Grant from the DWMHA for a second year in a row! This year we will be conducting Lifelines Suicide Prevention workshops in Voyager College Prep High School, throughout the summer during our Summer Steps Beyond Program and offering free QPR trainings as well. We would again like to thank the DWMHA for helping us provide this much needed service to the community.